I remember well the dreaded “rainy days” at school. My staff often got as frustrated as the students with indoor activities or a general lack of activities when days of rain held students and staff captive indoors for extended periods of time. In California, gyms or indoor areas for movement are few and far between and indoor hallways a rarity adding to the pent-up feeling of a world closing in. 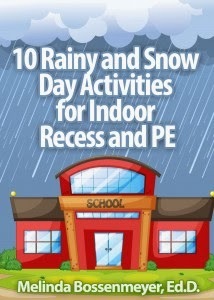 Today although a nuisance, there are many positive activities appropriate for rainy days that keep kids active and burn off excess energy allowing students to focus and sit during afternoon lessons. With the emphasize on physical activity with our First Lady’s “Let’s Move” Campaign, the National Association of Health, Physical Education, Recreation and Dance Association, created a list of activities designed for indoor activities for getting kids active called Integrating Physical Activity into the Complete School Day.